Blair Braverman And Her 'Ugly Dogs' Prepare For Her First Iditarod The rookie musher and her team of rock-star racers, with their own social media following, face heavy snow, subzero temperatures and 938 miles of Alaskan wilderness. Rookie musher Blair Braverman and her dogs will compete in the Iditarod Trail Sled Dog Race, traveling more than 900 miles across Alaska from Anchorage to Nome and facing subzero temperatures and challenging trails. You know LeBron, Serena and Messi. But do you know Pepe, Flame and Jenga? They're another kind of superathlete on a one-name basis with fans — sled dogs preparing for the Iditarod race. Blair Braverman, the team's musher, will take the dogs out for their first Iditarod when the race starts Saturday, braving some 938 miles of trail across Alaska, from Anchorage to Nome. It's a grueling race that took the last winner 9 1/2 days to complete, with unpredictable conditions, mandatory rest breaks and the notorious Happy River Steps, three near-vertical drops early in the course — just one of the many possible pitfalls for mushers trying not to crash. But this rookie is ready. Braverman has shipped food out ahead of time on bush planes, studied the weather, repaired equipment and made and remade plans. "How can you not overthink a 900-mile race?" she tells NPR's Ari Shapiro. "There's just so many different things that have to fall into place. It's like chess in the snow." "Mushing is one of the only sports where men and women compete together at elite level," she says. "We are taken seriously as athletes because there's no chance for people to tell themselves we're not on the same playing field." But she doesn't consider herself just an athlete. She's also a coach, a nutritionist, a parent, even a veterinary tech for her team. All her dogs, 14 hand-picked racers from a group of 20 that she has been training, have undergone physicals as extensive as the preparations for any professional athlete in the NBA or NFL, from electrocardiograms to vaccinations. "They were gone over with a fine-tooth comb by this great volunteer team of vets," Braverman says. "And I'm happy to report that they all have top marks in all their health records, and they're doing great." The dogs are a sharp but motley crew of strong personalities. Pepe is the steady, "mature" head of the pack. Flame is Braverman's "shadow" and has raced with her in every qualifier. Jenga, Flame's half sister, "doesn't suffer fools." And there are others, like Boudica, who loves gentle kisses; Colbert, a "big hunk" who is afraid of heights; and Grinch, who didn't make the Iditarod team because he had some directional trouble. On a recent outing, he stopped in his tracks and refused to run after Braverman turned the sled around to head north instead of south. "He has the biggest heart," she says. "The most energy. And he's incredibly stupid." It's clear from the way she talks about them that Braverman loves her dogs. And that love affair led her to start writing and tweeting. She describes the racers like you'd write about old friends, sharing their quirks, thrills and setbacks with tens of thousands of followers. 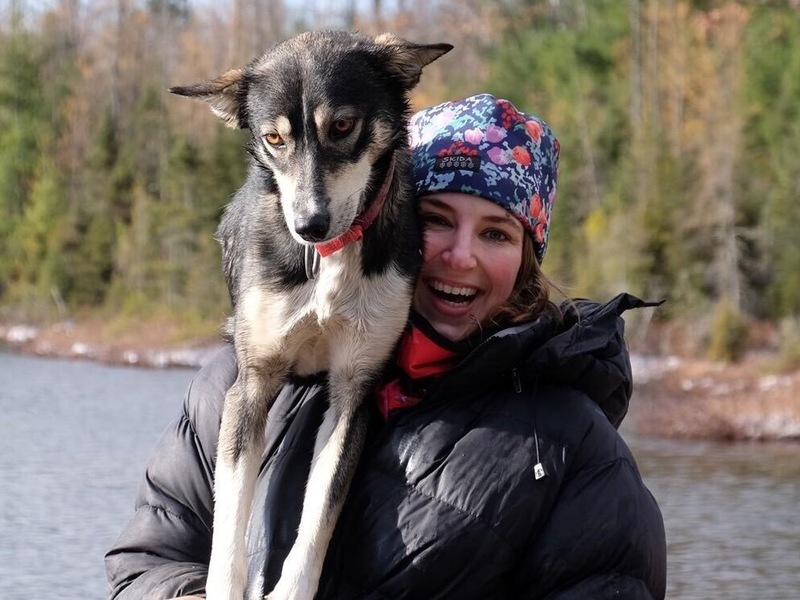 She calls her followers #UglyDogs, co-opting a phrase lobbed at her online. "A Twitter troll actually told me, 'Go back to your ugly dogs, Karen.' " (Her name isn't Karen.) "But I thought it was a beautiful sentence. ... Then some fans of the team said, 'We should be the ugly dogs because you'll always come back to us.' So it took off." Braverman suspects her account has gained traction because dog-sledding is a rural sport that takes place mostly out of sight — and her dogs give fans a way in. She spares no detail, from how to put booties on a dog that doesn't like her feet touched to her crew's bowel movements. "People are getting to know these dogs as pets, as friends, and they're also seeing them as elite athletes," she says. "It's like rooting for your favorite sports team, but they all happen to be dogs." One of the biggest misconceptions that she's trying to disperse? That the dogs are disposable. These are animals she has been with for years, she says, and she knows each of them as individuals. "I think rather than telling people how much we love these dogs," she says, "they can just feel how much we love these dogs and how much we're with them every step of the way." Braverman's long days of preparation are winding down quickly. The Iditarod kicks in the Alaskan midmorning on Saturday, and she admits it's terrifying to think about the race ahead. But, she adds, "if I think about being out there with my dogs, who are my best friends and my family, I just get so much strength from that." The long days, the sleep deprivation, the subzero temperatures — she's tackling all of that with Pepe, Flame and the rest of her dogs. And that's all the courage she needs. The broadcast version of this story was produced by Dave Blanchard and edited by Matt Ozug.